Poor ergonomic work practices or poorly designed workstations can play a significant role in the development of many preventable musculoskeletal disorders including neck and back pain, shoulder and arm pain, headaches and repetitive injury strains. Sitting for long periods each day has been shown to have catastrophic effects on health and wellbeing, putting workers at increased risk of diabetes, heart conditions, obesity, stroke, as well as postural muscle aches and pains. The best way to prevent poor ergonomic work practices, is to provide employees with the right information to be able to identify the issues or risk factors before they cause an injury. By up skilling employees, organisations are able to actively improve their working environment and make positive changes to the company’s workplace culture. Ergonomic assessments and ergonomic workshops are a great place to start when addressing these issues. 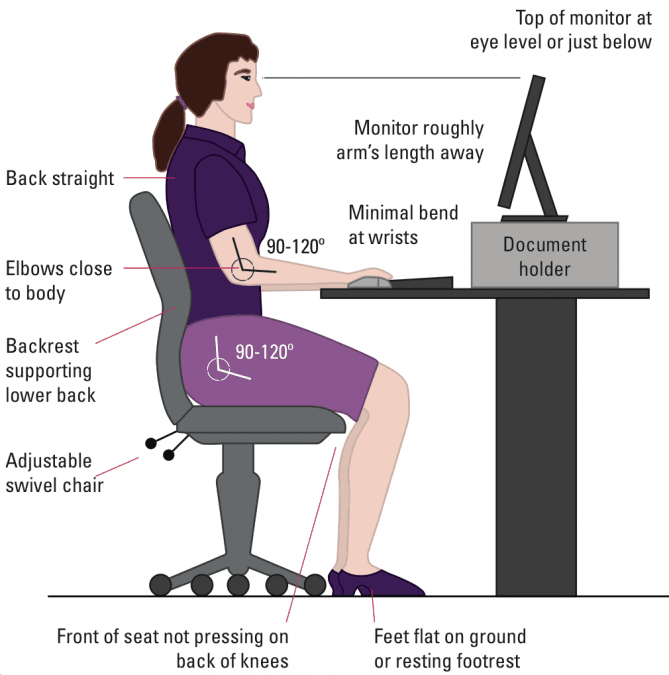 An ergonomic assessment involves assessment of an employee at their workstation to ensure optimal working postures and ergonomic work practices, correct workstation set-up. 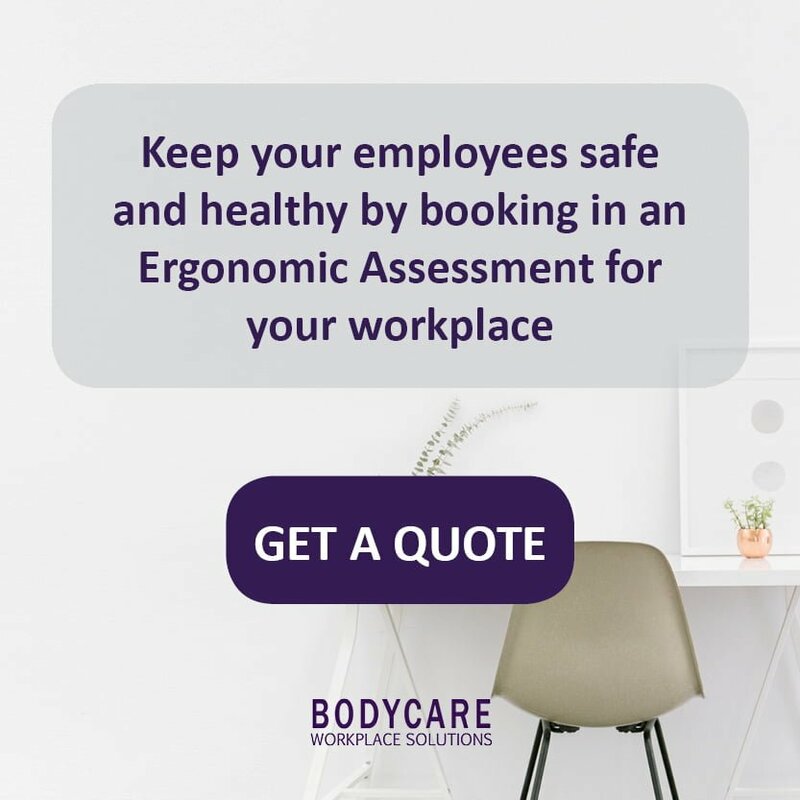 Bodycare’s Ergonomic Assessments are completed by fully qualified Occupational Health Professionals who are skilled in observing the work space and work practices of an individual. A formal report may be provided to the employer outlining all findings and any recommendations. Prolonged periods of sitting can often result in muscle fatigue and tightness, muscular imbalances and joint stiffness, especially around the neck and back. A consequence of this is an increased incidence of low back and neck pain, headaches, spinal dysfunction and joint degeneration, making it important to take regular breaks from static positions throughout the work day. A proven solution to mitigate the risks associated with prolonged sitting, is to implement the use of a standing desk. Standing desks allow employees to alternate positions throughout the day with little or no impact on their productivity. Bodycare’s ‘Sit to Stand’ workstation training and assessments evaluate how employees transition from sitting to standing to ensure that correct techniques are implemented and educates employees to utilise their workstation effectively, in order to improve individual postures. Make your safety program a key part of your company culture by actively committing to it at all levels of leadership. Bodycare’s team of Occupational Health Professionals lead your employees through interactive sessions, designed to deliver practical ergonomic education and advice in a “real world” setting. Each session is run in 30 minute blocks designed to be delivered at an employee’s workstation. Small groups (up to 6 people) learn the principles of setting up their workstation, to ensure they are working in an efficient and effective environment. After the practical demonstration, employees can immediately apply these learnings to their own workstation, whilst the Occupational Health Professional is available to answer any specific ergonomic questions.